TRUCKEE, CA--(Marketwired - January 05, 2015) - Clear Capital (www.ClearCapital.com), the premium provider of data and solutions for real estate asset valuation and collateral risk assessment, today released its Home Data Index™ (HDI) Market Report with data through December 2014. Using a broad array of public and proprietary data sources, the HDI Market Report publishes the most granular home data and analysis earlier than nearly any other index provider in the industry. Bright spots ahead in 2015 as we cast a spotlight on the low tier. Where we expect moderation and declining gains at the nation and regions, the low tier segment of the market nationally is forecasted to grow at around 3%. This tier will not only outperform the other segments on a national level, but also regionally. December data shows the low tier segment, homes selling under $95,000, hanging on to double digit gains of 10.4% nationally. But as we head into 2015, this may be the last we see of this magnitude of growth. 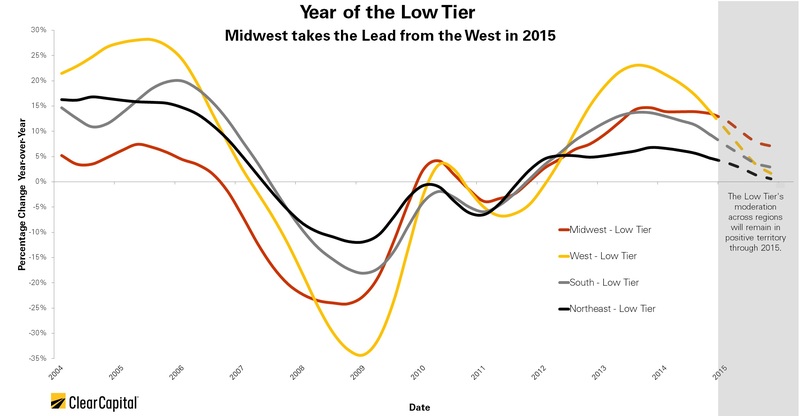 The low tier of the Midwest could see growth of 7%, which is more than double that of the national forecast for this segment, and more than 5 percentage points ahead of the West at 1.7% (Graph 1). Expect more from the Midwest as it outpaces the nation. Price growth in the Midwest is expected to outpace the nation on all tiers by 1.6 percentage points, nearly double that of the nation, in 2015. A cluster of metro areas that are projected to see some of the highest price growth over the next year are also located in the Midwest. Ohio leads the pack with the highest number of metros at the top of our forecast with predicted price growth in Columbus, Dayton, Cleveland and Cincinnati ranging from 2.2% to 4.5% in 2015. Dayton ended 2014 with gains in median home prices of 16.5% over the year. This is a drastic increase for a metro market that saw a price decrease of -2.3% just one year ago. Cincinnati also showed strong signs of growth at the end of 2014, with median sales price increasing by 9.1% in December, and an increase of 17.2% from 2013. The Bureau of Labor Statistics data shows Cincinnati experiencing private sector labor force growth in 2013 and 2014. This metro has made great strides at the end of 2014 with some of the largest declines in its unemployment rate in the U.S., suggesting a strengthening job market. In fact, all four of these metros have unemployment rates below the national average of 5.5%. Double-digit gains -- a thing of the housing recovery past. While the West continued to outshine the other three regions with 8.7% growth at the end of 2014, this is more than a 10 percentage point drop from where the region rounded out 2013 at 18.9% growth. The Midwest followed close behind with 7.7% price growth over the year in December 2014, down just 2.3 percentage points from 10.1% a year ago. The South and Northeast finished 2014 with 6.0% and 2.9% price growth, respectively, with these regions also seeing moderation to price gains from 2013. At the national level, December home price growth ends 2014 at 6.4%, down from 10.9% a year ago, with continued moderation in quarter over quarter gains throughout 2014, ending 2014 at 0.9%. Another wait and see year. Expect continued moderation for 2015. A year ago, we forecasted the start of a more mature recovery with year-end gains between 3% to 5% for the nation, and with price appreciation moderation one of the only consistent trends in 2014. In 2015, we will see the natural progression of the housing market regressing back to normal rates of growth. Current price trajectories suggest that price growth at the national level will continue to moderate to 1% to 3% with distressed saturation still above historical norms in some of the top 50 metros. Recent moderation in home prices and decreases in down payment requirements are increasing housing affordability in a time where rental demand is increasing and homeownership rates are at a long run low. The market will also have to contend with the challenges of stagnant wage growth, however, the increased affordability could encourage demand from homebuyers in the key fair market segments. 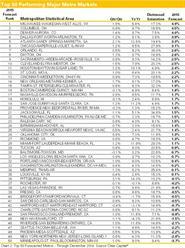 Contact Alanna Harter for your December 2014 file of the Top 30 MSAs or to access our data on the Bloomberg Professional service by typing CLCA < GO >. "Overall 2014 was a good year with prices up virtually across the board, though the rate of price growth has declined consistently since the year began," said Dr. Alex Villacorta, vice president of research and analytics at Clear Capital. "As we turn the calendar, we expect this trend to continue. Nearly all markets have experienced significant turbulence over the last decade and are only now showing signs of stabilization. This stabilization is likely to persist through the first half of the year until the market's recovery strength can again be measured going into the traditional buying season. "Locally, however, stabilizing home price growth and improved job numbers could reignite consumer confidence from traditional home buyers, setting up historically distressed markets like Ohio and the Midwest for success in 2015. The West had another standout year, with six metro areas in California alone returning a combined, increased average of 10.3% over the year. As we head into 2015, the West's white-hot performance will continue to wane and likely be eclipsed, on a percentage basis, by the Midwest, growing at 2.8%, compared to the West at 1.5%. The Midwest began rallying in 2014, and was neck and neck with the West in the most recent quarter at 1.1% and 1.0% respectively. The forecasted 2015 performance will come as no surprise to those with their eyes on market-level performance in the region." Includes equally-weighted distressed bank owned sales (REOs) from around the country to give the most real world look of pricing dynamics across all sales types. Clear Capital is a nationwide provider of real estate valuations, data and analytics, quality assurance services and technology solutions. The Company's customers include mortgage lenders, servicers, investors, GSEs, and Ratings Agencies. Clear Capital products include appraisals, broker price opinions, property condition inspections, value reconciliations, appraisal review and risk scoring, automated valuation models, and home data indices. The Company's innovative technology, experienced valuation experts, and a well-trained network of more than 40,000 field experts sets a new standard for accurate, up-to-date, and well documented valuation data and assessments. 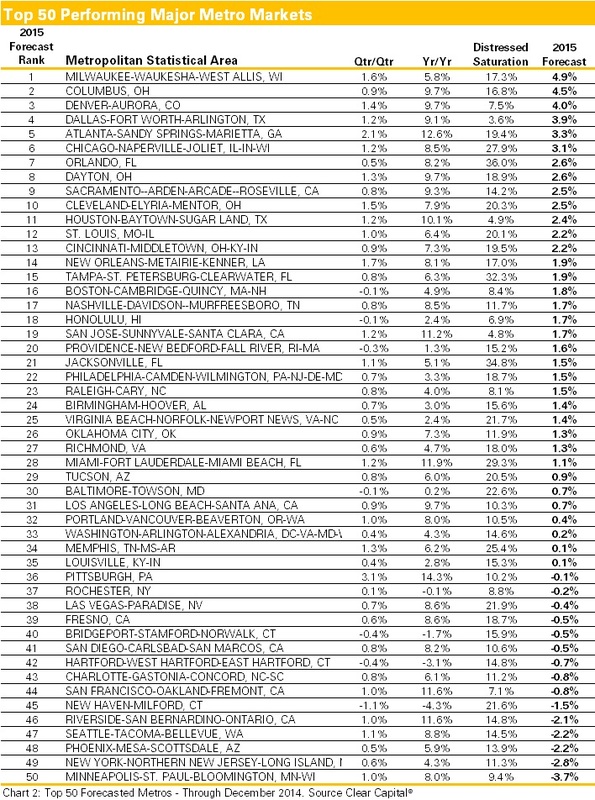 Morningstar Credit Rating issued Clear Capital its highest Residential Vendor Ranking -- MOR RV1. Clear Capital's home price data can be accessed on the Bloomberg Professional service by typing CLCA < GO >.